Not much is known about how mandrills behave in the wild, says Dr. Alan Dixson, a zoologist at Cambridge University and scientific advisor to the NATURE program Mask of the Mandrill. 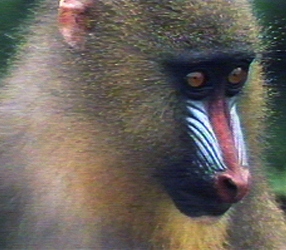 With their vivid blue and red facial and rump accents, mandrills are the most colorful mammals ever found in nature, but they are so shy, and they move so quickly across vast ranges of dense rainforest, that researchers have always had a very hard time following them, says Dr. Dixson. Consequently, many aspects of the mandrill’s social organization, mating systems, and other behaviors are still not fully understood. This, says Dr. Dixson, makes the species “the last great mystery among the family of Old World monkeys and apes.” The studies of Dr. Dixson and others are, however, beginning to unravel some of the mysteries. One of the most fascinating questions is why male mandrills sport such bright colors. 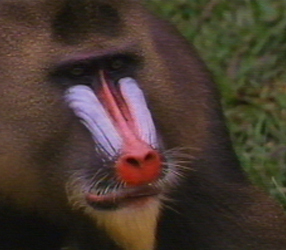 As seen in Mask of the Mandrill, Fangs, a dominant male who mates with many females, is much more colorful and larger than other, less successful males. He also has much higher levels of the male hormone testosterone. Why do some males hang back? They are essentially conserving their resources. If they are not likely to be able to mate, it doesn’t make sense physiologically to “invest” in reproductive characteristics. A more aggressive male, for example, is more likely to invite aggressive behavior from others, risking injury. There is also some evidence in other species that high testosterone levels can have a detrimental effect on the immune system. Just how the mandrill manages to suppress its development is not yet known. Another mystery is the purpose of a scent gland found on the chests of mandrills. Males in particular like to embrace a tree and rub up and down against it to deposit scent, says Dr. Dixson. “They all do it, but I haven’t got the faintest idea why. It may be that, given their large home ranges, the males are somehow communicating through these marks.” He suspects they might also use their bright colors for visual forms of communication. Frustrated with trying to follow the animals through the rainforest, Dr. Dixson did his research by building an observation tower near where the mandrills regularly gathered to feed. He watched their social interactions for many hours, and also managed to secure blood samples to perform DNA studies and determine the paternity of the offspring. The most colorful, most aggressive males, as he expected, had fathered most of the offspring. Although they are known for their shyness, mandrills are often called “the devil of the Fang,” a reference to the local Fang people, says Dr. Dixson. “If you see a mandrill in the wild, it’s likely to have a grinning facial expression, with the corners of its mouth open wide and the middle closed, and to be shaking its head from side to side, and showing its enormous canines.” It’s an entirely friendly expression, swears Dr. Dixson, but to our eyes, it seems devilish indeed. Thirteen Online is a production of Thirteen/WNET New York's Kravis Multimedia Education Center in New York City. Anthony Chapman, Director of Interactive & Broadband.